A unique theatre complex and the permanent home of The Royal Ballet, The Royal Opera, the Orchestra of the Royal Opera House and the Royal Opera Chorus. The Royal Opera House was built in 1858 to a design by E.M. Barry. It is the permanent home of The Royal Ballet, The Royal Opera, the Orchestra of the Royal Opera House and the Royal Opera Chorus, which perform on the historic main stage and in the contemporary Linbury Studio Theatre. The Royal Opera House also regularly hosts visiting companies from around the world. In addition to performances, the Royal Opera House offers a variety of dining options both for ticketholders and daytime visitors. All visitors can enjoy free exhibitions displaying items from the Royal Opera House’s historical Collections, while the Learning and Participation department hosts an array of free and paid for events throughout the building. The current Royal Opera House is the third theatre on its site, after the first two (built 1732 and 1808) were destroyed by fires. Aside from breaks during the two World Wars, when it was used first as a furniture repository and then as a dance hall, it has been in permanent use as a theatre since 1858. 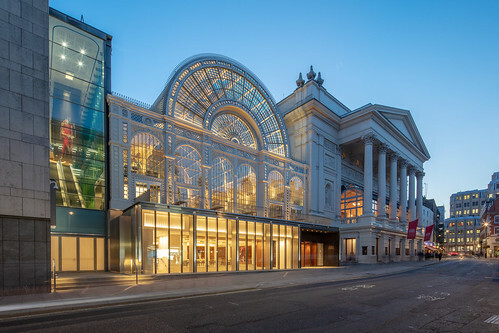 An extensive redevelopment programme between 1997 and 1999 equipped the main stage with state-of-the-art technology, while creating new performance and rehearsal spaces and new areas for public access – confirming the Royal Opera House as a world-leading cultural venue. Live music, dancers and actors lead you deep into the dark and delightful world of opera and ballet, where nothing is quite as it seems. Discover more about opera, ballet and the Royal Opera House in fun-packed Sundays, ideal for all the family, with a range of exciting and creative activities. Join us at this Royal Opera House Young Philanthropists event: a drinks reception and informal supper celebrating David McVicar’s stunning and electric production of Gounod's masterpiece.